Hosh was visiting his maternal uncle in his school holidays. "Mamaji, can you please teach me how to cook your famous dry curry chicken," asked Hosh. "Your Ma told me you were learning to cook," said Uncle Shan, as he wrapped up his newspaper and got up. It was time to prepare lunch anyway. As Hosh collected the ingredients, Shan lit the gas hob. He placed the pressure cooker on high heat and put in the mustard oil. "Will it be okay to cook this on the electric stove at home Mamaji?" asked Hosh. "Yes, should be fine," Shan answered, "There might be some difference in taste, but you expect slight variation anyway when two different people cook it on two different days. But it should still taste good!" About 5 minutes later, Shan added the onions, asafetida and salt into the pot. "Do you know why we put salt and asafetida at the same time as the onions?" Shan asked, as he continuously stirred the onions. "Don't know about Asafetida," Hosh replied, "but salt would help soften the onions faster." "That's right," Shan continued, "Asafetida, called Hing in Hindi, is a dried resinous gum, which is discharged from the rhizome or taproot of several types of Ferula herbs. The species was native to Afghanistan, but is mainly cultivated in India." "It is because of its fetid smell, that it was named asa-'fetid'-a. The French even went so far as to call it 'merde du Diable' (literally meaning, Devil's faeces)." "Ew," said Hosh, "I don't want to put that in then." "Cooking it removes its malodor," Shan laughed, "So by putting it in now, it will have enough time to cook." "Asafoetida is quite prominent in Ayurvedic medicines due of its antibiotic properties. It is easy to digest, and enhances appetite, taste and digestion." The onions were golden brown now. Shan added garlic, ginger, chilies and tomatoes. After a further 2-3 minutes, they added in the remaining spices, and mixed the gravy for another minute. Shan asked him to put the chicken wings and breast pieces in now and stir. "We will add the thighs and drumsticks in a few minutes," he said, "because they cook faster and so the flesh will detach from the bone if we put them in now. Add the lemon now if you want, else cover and leave. You don't need to affix the pressure cooker lid yet, just cover the pot with the lid on top." When instructed a couple of minutes later, along with the drumsticks and thighs, Hosh added the water. He mixed the meat and gravy and affixed the lid to the pressure cooker pot. "Our work is almost done now," Shan said, "Leave it for 3-4 whistles, which will go off by themselves when the pot fills with steam. Steam pressure pushes the whistle up on the cooker. After it cooks, we'll watch a YouTube video with another way of cooking curry chicken in a pressure cooker to compare notes." They sat and talked about life in New Zealand. 3-4 whistles went off in about 15 minutes. Shan lifted up the whistler top with a spoon to release rest of the steam. "The whistler will be really hot so I'm not going to lift it with my hands," he tipped, "If I don't release all the steam, I can't detach the cooker's lid because the pressure from the steam won't let me push the lid down to turn it." Shan opened the pot and continued, "Now check that the meat is tender by squeezing it between your fingers. Taste the gravy for spiciness and salt - add more if needed. Leave the lid off to thicken the gravy." "If we wanted to make the gravy more watery, we could add more water at this point. 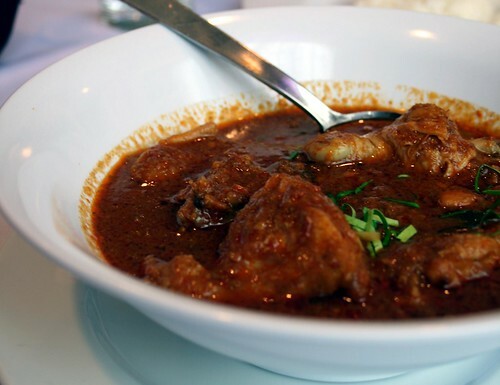 Generally dry curries are better with roti or breads and watery are better with rice." "Wow Mamaji! This tastes and smells delicious! I'm happy with the thickness of gravy we have right now," exclaimed Hosh. "Great, so all we need to do now is add chopped fresh coriander. But because your Mamiji (aunty) hasn't made the rotis yet, we'll affix the cooker's lid again and turn off gas. The final steam that will now form will be enough to keep our dish warm, but not enough to change the thickness of our gravy." "Mmmm... I can't wait to eat it!"